The end of February was remarkable for a couple of things. First was PyCon Philippines 2014. I’ve already mentioned here a bit of my involvement with Python Philippines. I’ve noted my presence in Python Philippines’ monthly meet-ups. 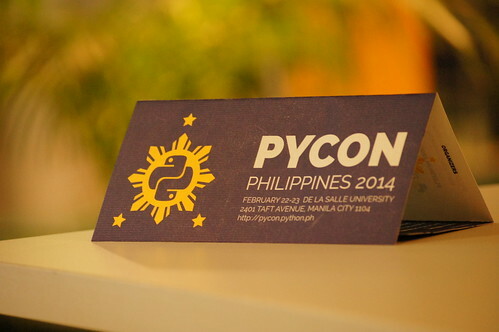 It is no secret that we’ve been working towards another PyCon Philippines. I must say, organizing a conference is really a taxing job. Kudos to the volunteer team who worked really hard behind the scenes. And while yours truly was listed everywhere as a volunteer, it would be terribly unfair to compare the effort I spent compared to the effort of some others. For day two, I was a speaker in behalf of Chikka. Chikka sent in a delegation of 26 corporate attendees. However, I was not able to finish day two because I had a flight to America scheduled. You see, I was in for an interview with the Google. Yes! It has always been my dream to work on the type of problems which Google is tackling. I never thought that, as early as now, I’d be able to score an interview with them, at the Mountain View campus, no less. I did not get in but I’m no less grateful that I’ve had this opportunity. While this whole adventure deserves a whole post on its own, let me end with the update I had at my Facebook profile after the closing phone call came. It started one Saturday morning in October last year. I received an email from an “@google.com” email address. He claimed to be a recruiter from Google who got impressed with my GitHub resume. Now, prior to this I’ve already received a number of recruiting calls due to my GitHub and my PythonPH involvement. But, hey, Google? The Google? Just. Wow. So…okay, I just sent in a copy of my proper resume as the recruiter wanted. Weeks passed without hearing anything from the recruiter. Until December. He had me scheduled for a 15-minute phone interview. I thought that Google will finally have developer operations in the Philippines. During this 15 minute interview, it became clear to me that I’m interviewing for a position at their Mountain View campus. The interview went fine which led to a 45-minute technical phone interview in January. Apparently, they got impressed with it as well because they eventually had me for an onsite interview. After some bureaucratic fiascos with travel documents, I finally managed an onsite interview during the last week of February. Google had me for an all-expenses paid US trip. I was in California for around four days. I’ve been to a number of interviews already and I must say, Google is really different. They call it a panel interview but I think a better term is “circuit interview”. And it was more like a mentorship session than anything. No pressure, just geek-to-geek chat. I managed to answer all of the problems they gave me which is to say I performed better than I expected (haha!). I just got a call saying I did not make it but getting from that October email to that closing phone call is still quite a ride. I’m 21, college-age in America’s educational system. I’ve less than two years industry experience, while most of Google’s job openings require at least three. I did not approach Google; Google approached me. I think I’ve earned the right to be very proud of this experience. The longer Story, sometime soon!